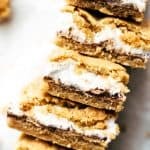 Best S’mores Cookie Bars! Soft & chewy graham cookie dough. Tenderly melting chocolate bars. Creamy peanut butter. Gooey marshmallow fluff. 11 ingredients & 15 minutes prep time. No seriously… these are the best ever S’mores Bars. You are asking why I am so sure? 1. Easy 8 ingredient graham cookie dough. The cookie dough on top and the bottom is soft and chewy and ridiculously easy to make. My tips for extra chewy cookie layers are: melting the butter and using just brown sugar. Brown sugar also has a great taste and fits perfectly to the graham crackers. Just combine all the ingredients in a large bowl. That’s it. You have your cookie base. Super easy! Don’t overmix at any step. Just until combined. When you overmix the dough, it will get dry. 2. Tenderly melting chocolate bars. The chocolate is everything! I always use high-quality chocolate bars when it comes to s’mores. The taste of s’mores stands and falls with the quality of the chocolate you use. It doesn’t matter if you make yourself original s’mores or any s’mores bakery, just make sure that you always use good chocolate. I prefer brands like Hershey’s or Lindt when it comes to chocolate. The taste is intense, and the consistency is tenderly melting. 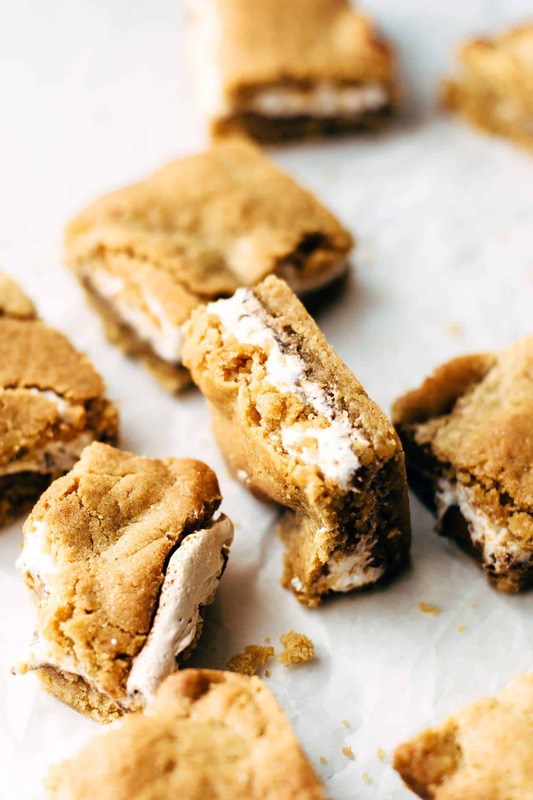 Perfect for our S’mores Cookie Bars! 3. Gooey marshmallow fluff. Lots of. 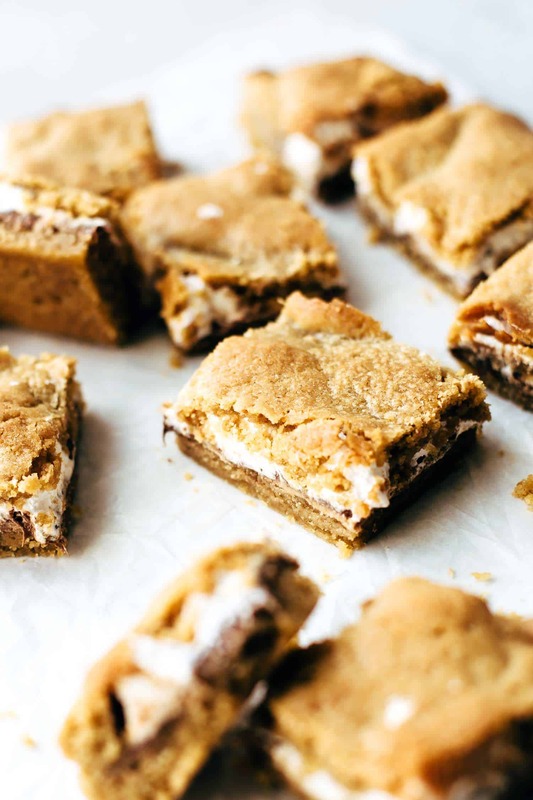 As you can see in the pictures, there is a lot of gooey marshmallow fluff inside these S’mores Cookie Bars. Think of original s’mores. You have two thin graham crackers, one layer chocolate bars, and a big marshmallow sandwiched in between. With these bars, it’s pretty much the same. The thick layer of gooey marshmallow creme is mind-blowing. Campfire feelings are rising. 4. 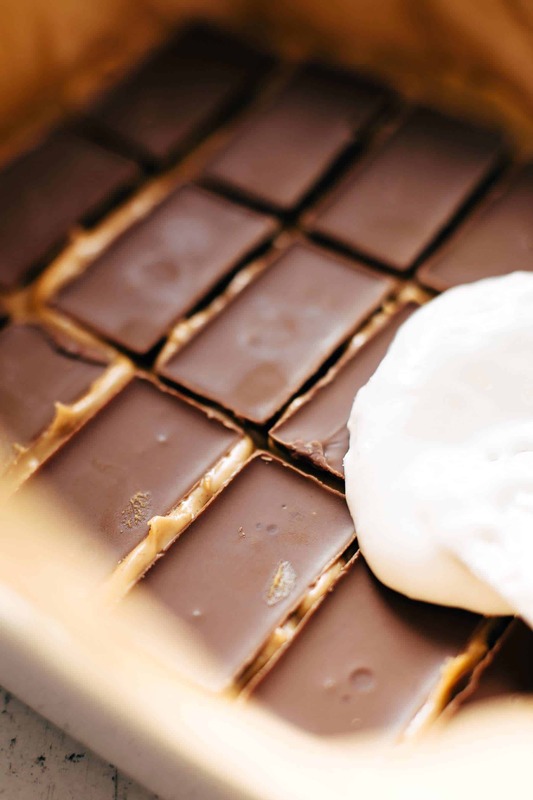 Although its optional and up to your preference, the peanut butter layer takes these bars pretty much to the next level. 5. Strong flavors, gooey, chewy, soft. 6. Easy campfire snack without campfire needed. 8. So fun to eat. I know today is Halloween, but you don’t need to roast some marshmallows in your jack, just put these bars into your oven and enjoy your Halloween night. You may also like S’mores Cake, S’mores Cookies, Fluffernutter Cupcakes, Peanut Butter Ice Cream Cake, or click here to see all things sweet. 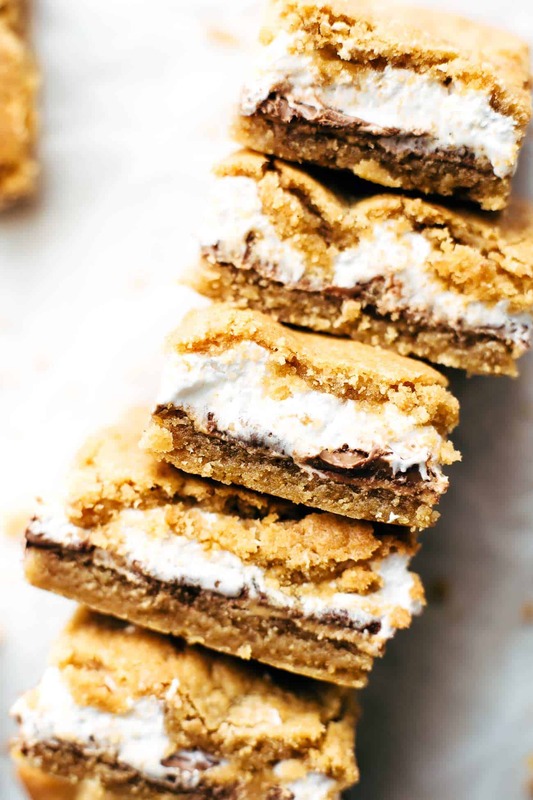 Best S'mores Cookie Bars! Soft & chewy graham cookie dough. Tenderly melting chocolate bars. Creamy peanut butter. Gooey marshmallow fluff. 11 ingredients & 15 minutes prep time. Preheat oven to 350°F (175°C). Line a 6x10 or 8x8 inch baking dish with parchment paper. Set aside. Make the dough: Beat butter and sugar with a handheld or stand mixer fitted with a paddle attachment on medium speed until combined for about 1 minute. Add vanilla* and egg and mix just until combined. Mix in flour, graham cracker crumbs, and salt just until incorporated. Transfer the half of the dough into the prepared pan and press into the bottom of the pan evenly. 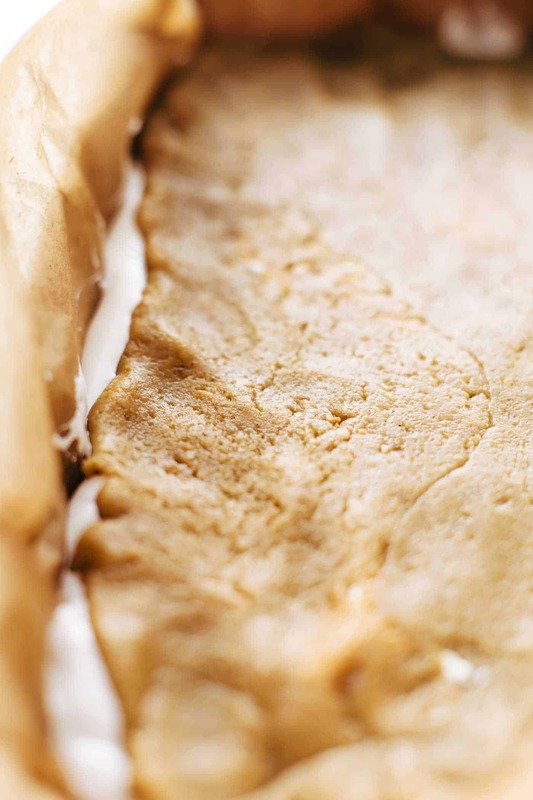 Lift out dough layer with parchment paper. Set aside. Line baking dish again with parchment paper and press the remaining cookie dough into the bottom of the pan. Spread peanut butter on top and layer with chocolate bars and marshmallow fluff. Place top cookie layer on top. Bake for about 28-30 minutes or until golden brown. Let cool to room temperature before cutting. Store leftovers in an airtight container at room temperature up to 3 days.